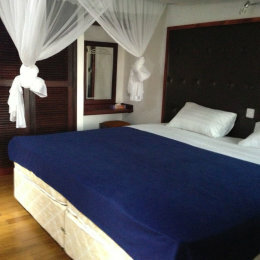 2 deluxe suites of two bedrooms each having views of the Mara River from the veranda. The rooms are decorated in vibrant Masai colours with bright fabrics and rugs. Timber beams support the thatched roof that keep the rooms warm in the cold Mara weather. 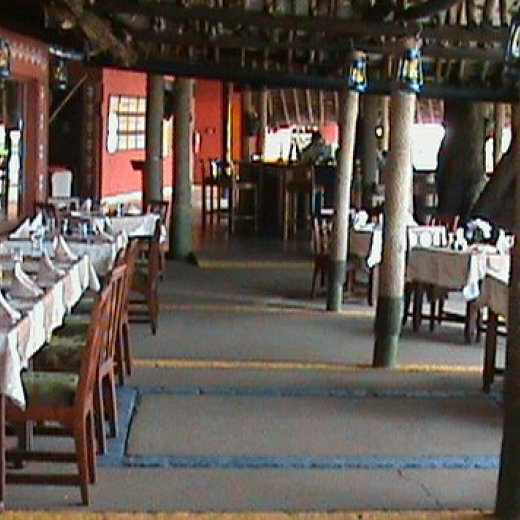 The restaurant serves the tastiest examples of Kenya’s rich and varied cuisine. Choice cuts of meat, poultry and fish are subtly blended with exotic local flavours and deliver a truly African experience prepared to international standards. Mara River Lodge commands one of the most spectacular views in the Serengeti - Mara ecosystem, the lodge lies on the Mara River at the edge of Masai Mara National Reserve and overlooks deep pools where crocodiles and hippos bask all day. There are 80 en-suite rooms including 2 deluxe suites of two bedrooms each having views of the Mara River from the veranda. All rooms are decorated in vibrant Masai colours with bright fabrics and rugs. Timber beams support the thatched roof that keep the rooms warm in the cold Mara weather. The lodge's restaurant serves the tastiest examples of Kenya’s rich and varied cuisine. Choice cuts of meat, poultry and fish are subtly blended with exotic local flavours and deliver a truly African experience prepared to international standards.